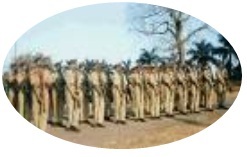 The college has an NCC unit (Senior Division, The Coy No 4 under 56 Bengal Br.). Students are given NCC training to enable them participate in different certificate courses that help them getting recruitment in Indian Army and Air Force. The programmes of the NCC unit of college aims at including the values of discipline, responsibility and national integrity and promote active participation in the observance of National Days and Foundation Day of the college.